Rachel bas-cobain was born in 1937 in New York, NY and worked primarily in Brooklyn. While trained in painting and printmaking, bas-Cohain would, over the course of her career, expand her scope of interest to include a variety of disciplines including music, graphics, kinetics, and other fields of study. 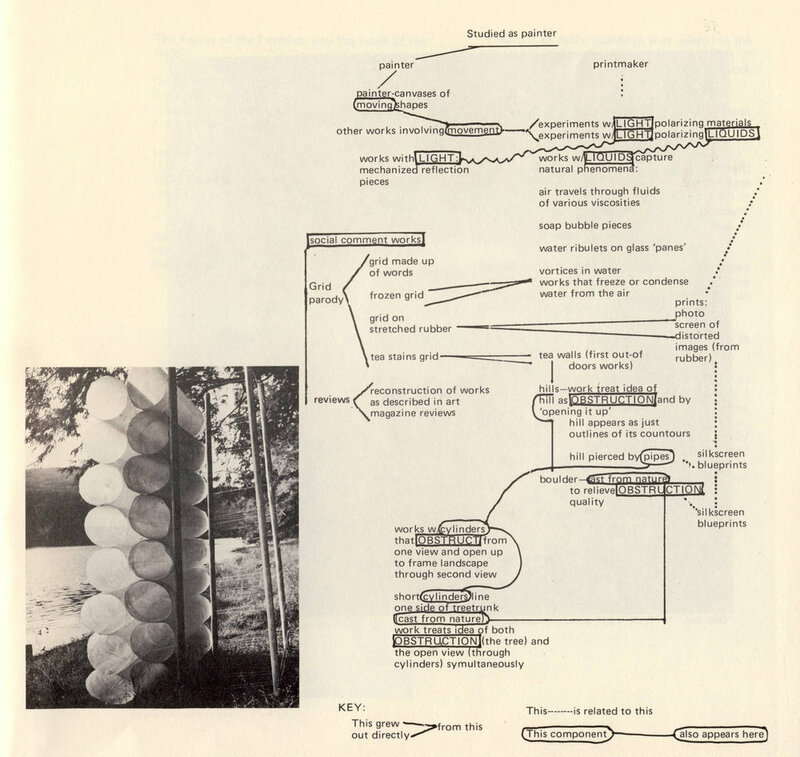 Conceptually, she often played with audience perception of visual and physical information. In “Frozen Grid,” for example, bas-Cohain assembled a kinetic sculpture whose appearance and texture she could alter at will. Through a clever manipulation of a copper wire grid, a copper rod, and a refrigeration unit, the wiring would appear either cold and metallic, or soft and fuzzy, depending on how much moisture had crystallized on the wiring after turning on the refrigeration unit. Though she is more so known for her gallery installations, bas-Cohain also took an interest in Land Art early in its development. The genre provided an opportunity for the artist to continue her experiments with visual impressions of a physical objects; in 1982, she designed a series of large outdoor “flat sculptures” that gave the appearance of either geometric abstractions or dimensional building-like structures, depending on where one stood. Such prescient endeavors remain as challenging and exciting today as they were during their conception. Rachel bas-Cohain received her arts education at the Art Students League of New York, The New School for Social Research, the Brooklyn Museum School, and Brooklyn College. Additionally, she was a graduate of the Brooklyn School of Music and gained a two year grant from the Radcliffe Institute in Cambridge to continue her studies. Despite her many artistic and academic accomplishments, bas-Cohain, like many women artists at the time, struggled to advance her career due to the lack of opportunities for women in the arts. After becoming one of twenty founding artists of A.I.R., she gained both a platform for her work as well as the exposure needed to further pursue her artistic ambitions. During this time she produced “Frozen Grid” along with other explicitly feminist work. Rachel bas-Cohain would continue to make political, reflective, challenging work up until the last year of her life in 1982. Her last work, shown at A.I.R. Gallery in March, 1982 were photographs of the flat sculptural string drawings constructed on the landscape, and a series in which silk organza forms were suspended in clear lucite boxes. She made the silk organza sculptures during her illness, sometimes working on them in her hospital bed. These works express her experience of loss, the fragile nature of the body, and celebrate the power of art where words are no longer adequate.